This custom engraved picture frame makes a beautiful Christmas gift for your partner or a newlywed or just engaged couple. A custom picture frame is a simple, yet totally unique and exceptionally meaningful Christmas gift. It’s a great way to show your loved ones that you took the extra time and thought to create something that’s truly theirs. Whether you’re shopping for your new boyfriend or girlfriend or your partner of many years, the “Because of You” picture frame can help express just how you feel this Christmas. 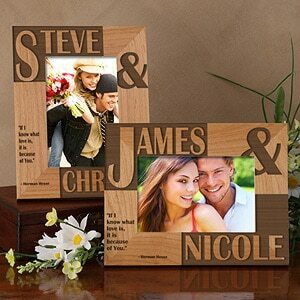 This uniquely designed engraved picture frame allows you to add two names along with a short message. You can choose one of five profound love verses or write your own personalized message of love and affection. Your custom picture frame can feature the classic quote from Hermann Hesse that proclaims “If I know what love is, it is because of You” or any love quote or message that will resonate with your loved one. And once you decide how to customize your frame, you can preview the completed design to make sure it looks just the way you want it. This gorgeous custom photo frame is delicately laser engraved on natural wood and can be customized in either vertical or horizontal orientation. You can choose from three size options to fit 4×6, 5×7 or 8×10 photos and use the frame as a table top display or feature it on your wall. Beautiful, natural wood with wood grain variations that make each picture frame unique. Choose from 4×6, 5×7 or 8×10 photo sizes in vertical or horizontal orientation. Ready for wall mount or use the easel back for shelf or table display. Add any 2 names and up to 7 lines of custom text. If you’re looking for a simple and affordable Christmas gift that’s unique and meaningful, the “Because of You” custom engraved picture frame is a great choice that your loves ones are sure to cherish for years to come. Love these frames, so perfect and unique! would be a perfect Christmas gift! I Love these picture frames to put special pictures in!!! Beautiful product. Very romantic! This makes the perfect Christmas Gift.